Discover some non-financial services organized by the MFI Al Majmoua in 2013, the MicroWorld's partner in Lebanon. 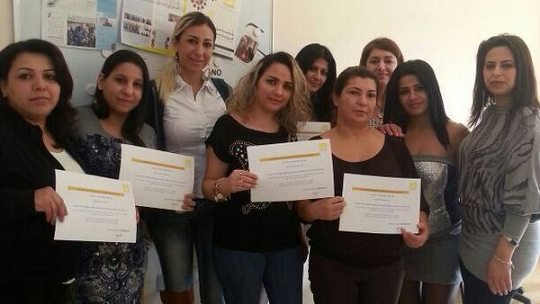 As part of its non-financial services, Al Majmoua’s Business Support Services Unit regularly offers Financial Education and vocational trainings to women beneficiaries like the program conducted, in November 2013, in the Choueifat branch. A vocational training on accessories design and a training course on Financial Management was delivered to 7 beneficiaries including women who are not loan’s recipients. The course was characterized by the enthusiastic spirit of the beneficiaries, their cooperation and the level of experiences’ sharing among the participants. Based on what was acquired, future plans for the expansion of their businesses were made. The participants fervently asked for other training courses for them to attend. At the end of the training program, certificates of participation were distributed to the participants. As a result of this training course, Al Majmoua was able to encourage previous beneficiaries to reconsider taking a loan, or even to attract potential clients who would like to access a group loan to buy materials and start working on accessories. The women also expressed the desire of their husbands and relatives to apply for loans at Al Majmoua. Al Majmoua’s Business Support Services Unit offered also Business Management and Financial Education to women and youth beneficiaries like the program conducted, in September 2013 in the North Governorate of Lebanon. In partnership with the Rouwwad Association, Al Majmoua delivered psychological support sessions and business management trainings in times of conflict to eight women who are being negatively affected by the on-going armed conflicts in the Tebbaneh area (Tripoli). The main objective of this training program was to provide them with emotional support and to enable them to start up and develop their own projects. They were trained on the following topics: goods’ packaging, business management, financial management and lending. The course’s closing ceremony, which was held in September 2013, included the distribution of the certificates as well as a presentation conducted by a Loan Officer from Tripoli’s branch office, Georgette Dallaleh. This presentation portrayed the different services that Al Majmoua provides. Following that two different trainings, Al Majmoua also allowed 40 women from various areas to benefit from “awareness sessions” that tackled topics related to women empowerment and the importance of her role in society. To finance microentrepreneurs projects in Lebanon with Al Majmoua on MicroWorld, click here.